Oliver Adams was the husband of Peckham's sister-in-law, Zilpah Sawyer Adams. Peckham probaly painted this portrait of his nieces and nephews on the sad occasion of the death of young Joseph Sawyer Adams in 1831. Depicted in red at left, Joseph (1828–1831) stands next to his two sisters Frances Anne (1824–1838) and Laura Anne (1826–1897) and his baby brother John Quincy (1830–1837). The famiy record seen on the back wall lists not only those children pictured but others who had died. The portrait is thought to have been painted in the Adams home in Boston, Massachusetts. This transitional work for the artist makes use of a smaller format than his later paintings. Peckham posed the children somewhat stiffly and generalized their features, but he also displayed a sympathetic understanding of his subjects, who gaze directly at the viewer. Peckham's close attention to furnishings is seen in the carefully depicted woodgrain of the cradle, the brightly colored carpet, the tack-decorated trunk bearing the initials "O.A," and the family record hung on the wall. As in several other works by Peckham, the children are posed before a door, but this one is open to reveal a landscape outside the window, an unusual element for the artist. The scene would have been familiar to Peckham since he and his wife lived in Bolton from 1816 to 1819. Robert Peckham had ten children: nine with his first wife, Ruth Wolcott Sawyer (died 1842), and another child by his second wife, Mahalath Griggs. When these two portraits were purchased by their current owner's ancestor, they were noted as depicting two of Peckham's children. Judging from the apparent ages of the subjects, and from the "G. R. Peckham" lightly incised in the boy's collar, it appears that they are the likenesses of Peckham's daughter Ruth (born 1825) and son George Robert (born 1827). While these portraits share many of the earmarks of Peckham's style, they have a greater sense of immediacy than his more formal works. There is a palpable affection communicated in the likenesses, and the sitter's faces are relaxed and slightly smiling. Unlike their grander, commissioned works that show children wearing their Sunday best, this pair is painted in plain, everyday dress. One can image the artist requiring Ruth and George to pause in their chores or play, in order to come over and pose. The canvases show evidence of having been folded over at some point, perhaps even while the paint was not quite dry, in order to accomodate smaller frames (the original dimensions have since been restored). Modest in size and almost certainly made for his family's pleasure (and perhaps to hone the artist's skills) these works demonstrate Peckhams' special affinity for young subjects. 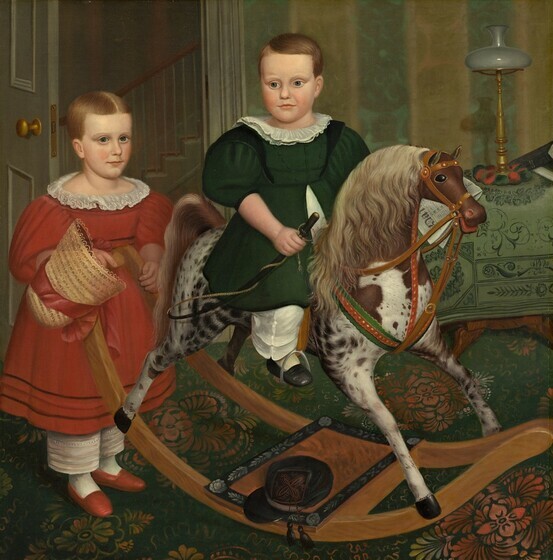 Like The Hobby Horse, this painting came to its present collection as a gift of renowned folk art collectors Edgar William and Bernice Chrysler Garbisch. Without any idea of the works' authorship, the Garbisches recognized the visual appear and documentary importance of both portraits. It was not until 1979, when Metropolitan Museum researcher Dale Johnson recognized connections between these and a few similar portraits, that the name Robert Peckham was proposed as the artist. Anne Elizabeth (born 1832) and Joseph Estabrook Raymond (born 1834) were raised in the town of Royalston, not far from Peckham's home in Westminster, Massachusetts. Their father was active in business and local politics. As in several other Peckham portraits, the children are shown rather tightly enclosed in a corner of the interior. They appear to come from a family of means, as they are fashionably dressed and surrounded by some of the acoutrements of a comfortable life: a floridly patterned ingrain or Brussels carpet, an 1820s Pembroke table, a bisque china doll, a pull-toy dog, and books indicating a conscientious religious edication: a Bible and Isaac Watt's poetic paraphrases of the Psalms (first published in England in 1719 and in Boston in 1939). The straight-sided Staffordshire mug seen behind them, which bears the inscription "A PR[E]SENT FOR JOSE[PH]," is a type that was imported from England in substantial numbers and given to children as a reward for good behavior. A mug of exactly this desgin is included in Peckham's 1822 portrait of his newphew John Adams (private collection; reproduced in Peter Tillou, Where Liberty Dwells: 19th-Century Art by the American People, 1976, no. 28). This appealing portrait, a favorite of visitors to Colonial Williamsburg's Abby Aldrich Rockefeller Folk Art Museum, depicts the daughter of the founder of the Walter Heywood Chair Manufacturing Company in Fitchburg, Massachusetts. Rosa (whose name was also recorded as Rosette) was born in the adjacent town of Gardner in 1834. She married the company's treasurer, William Otis Brown, in 1870. Rosa is shown, strongly illuminated, in the corner of a room. Behind her a decorative planter contains a rosebush, presumably brought inside for this occasion, from which she has plucked a blossom that refers to her name. Her impressive dress, with its shirring and piping, and gold necklace bespeak a family of some means, as does the brightly patterned carpet and wallpaper (barely distinguishable in the shadows). Though the painting is not signed or inscribed, it shares several characteristics with portraits attributed to Peckham, including the prominent indentations of the skull at the child's temples, a stiff, frontal pose, strict attention to details of costume and furnishings, and a floor with an exaggerated upward tilt. Most arresting is Rosa herself, whose forthright gaze engages us intently and directly—one of the most distinctive aspects of Peckham's portraits. In this complex composition, each of the children is portrayed holding a different object: Elizabeth Mersylvia (1831–? ), flowers; Sarah Charlotte Tucker (1835–? ), a doll; Maria Thurston (1838–? ), a kitten; John Albro (1833–? ), the handle of the baby's carriage; and Mary Jane, a gold locket. The artist captured a wide variety of colors and textures, as well as the serious countenances of his subjects. Despite occasional awkward passages, such as the crudely depicted hands, the overall effect was no doubt grand enough to have satisfied the children's parents. Only the figure of the baby seems to be unresolved, a common difficulty for Peckham, who faithfully recorded the subjects before him, but could not imaginatively summon up the features of the deceased. According to a Farwell descendant, Mary Jane's gown was placed in the carriage while the painting was in progress to help the artist envision his composition. Captured as he is about to leave for school, young Webster (1834–1872) pauses at the door, cap in hand. With his slightly unruly hair and perhaps a faint smile, he stands in the corner before what appears to be a fireplace mantel, and upon a colorful yet fairly common Venetian carpet. While probably true to life, the size and shape of the boy's head may reflect the nineteenth-century interest in phrenology, a pseudoscientific belief that the shape of the skull could indicate intelligence and character. Here, Webster's broad forehead sculpted in light may have been intended to suggest the boy's astute and moral nature. The family for whom the portrait was commissioned was one of the earliest to settle in Winchedon, Massachusetts. An 1849 history of the town notes that Seth Tucker, from whom Webster was descended, was one of the original four settlers of Winchesdon village. By 1848 there were "within the limits of the village, 640 inhabitants, 92 dwelling houses, three meeting houses, 1 Academy, 1 school house, 1 large hotel, 9 stores, 1 woolen factory, 1 iron foundry, 1 machine shop, 1 grist mill, 2 saw mills, 1 large bobbin factory, 1 tannery, 1 tub manufactory, 1 pail manufactory, 2 livery stables,... 4 blacksmith shops, and various other shops for manufacturing and mechanical purposes, occupied by carpenters, coopers, wheelwrights, turners, shoemakers, harness-makers, tailors, and other mechanics..." (Ezra Hyde, History of the Town of Winchedon from the Grant of the Township by the Legislature of Massachusetts in 1735 to the Present Time, Worcester, 1849.) In this thriving economy, an artist with Peckham's talents would have readily found a place. Is this a painting by Robert Peckham? Certainly it shares the compressed corner space that is seen in many of his portraits of children. It has, as well, the Peckham elements of strong, single-direction light, attention to the details of furnishings, and an upward-tilted floor that exposes more of the carpet's lively pattern than would be seen in realistic perspective. Charles and Emily stand stiffly and solemnly, engaging us with their direct gazes, another characteristic of Peckham's painting. Yet the work appears to differ in subtle ways. The artist's palette is more subdued and the paint appears to have been applied more thinly than in the other works. However, the number of similarities with works attributed to Peckham suggests that this painting is connected to the artist. The unusual way in which the ground (layer beneath the surface paint) is brushed diagonally from lower left to upper right is also seen in The Raymond Children and The Hobby Horse. The portrait is believed to depict a brother and sister from Malden, Massachusetts: Charles Lynde Eaton, born March 1841, and Emily Lynde Eaton, born 1838. Given that Charles is shown not yet wearing trousers (attire that boys assumed around age five), the portrait probably dates from around 1844 or 1845. The pair of Argand lamps on the mantel and the astral lamp on the marble-grained table suggest a well-appointed home. Nearly all of Peckham's sitters were from Worcester County, but these children lived just north of Boston, in Middlesex County. If they were, indeed, painted by Peckham, his range of activity may be wider than we thought. This portrait of an unidentified brother and sister was titled, upon its acquisition by Edgar William and Bernice Chrysler Garbisch, for its most prominent feature. The toy is perhaps more properly called a rocking horse (the term hobby horse often refers to the simple stick with horsehead), but the painting has retained the descriptive title. The Boston dealer from whom the Garbisches purchased the work recorded that it was found in an antique shop in Billerica, Massachusetts, but no clues as to artist or subject were attached. The typeface of the newspaper behind the horse's head may point to the Daily Evening Evening Transcript (later the Boston Evening Transcript). The style of the children's clothing suggests a date of about 1840. While the boy's eyes look sideways, the girl's gaze connects her strongly to the viewer. We are invited into this tidy domestic space by the open door that hints at a substantial home. The artist particularizes the setting by carefully delineating each element: the colorful ingrain carpet, the rainbow wallpaper, the state-of-the-art sinumbra lamp on the table covered with an embroidered cloth. This intense attention to furnishings is characteristic of Peckham's portraits of children in interiors. This impressive rocking horse was well loved and well worn by successive generations of the Marrett family of Standish, Maine. Handcarved and adorned with a horsehair mane and tail and glass eyes, it is covered with animal hide (probably calfskin), now mostly rubbed smooth, but the stiching of which can be seen on the inside of the horse's legs. Several sellers of toys and woodenware advertised rocking horses in the late 1850s, and a number of companies, including Massachusetts toymakers Morton E. Converse in Winchedon and Whitney-Reed in Leominster, produced rocking horses in the later decades of the nineteenth century. The Marrett House example, however, comes from the early, prefactory tradition of the individual craftsman or small workshop. Inscribed on one of its rockers with "Herman & Co/ No 166 Washington Street. / Boston," the horse appears to be the produce of Ferdinand Herman, listed in the Boston directories at that address in 1857–1860. A few years earlier (Annals of the Massachusetts Charitable Mechanics Association, 1853), Herman was listed as a "Fancy-Basketmaker," and in 1861 the Boston Directory his company offered "Baskets and toys." The Marrett horse shares the same arch of the neck and elegant bow of the rockers that grace the Hobby Horse example. Both toys are also decorated with stenciling, one on the sides of the rockers, the other on the platform. The only odd note in the Marrett example is the addition of an elaborate red saddle identified in an inscription on the rocker as "New Mexican Saddle to Support the Back." It has been suggested that the rocking horse depicted by Peckham was created by a crafstman of English or German origin, working in this country, a supposition that may also be true of the artisan who created the Marrett horse.